About this same time last year I posted about a 'Sampler' rescued from Salvation Army Thrift Store. 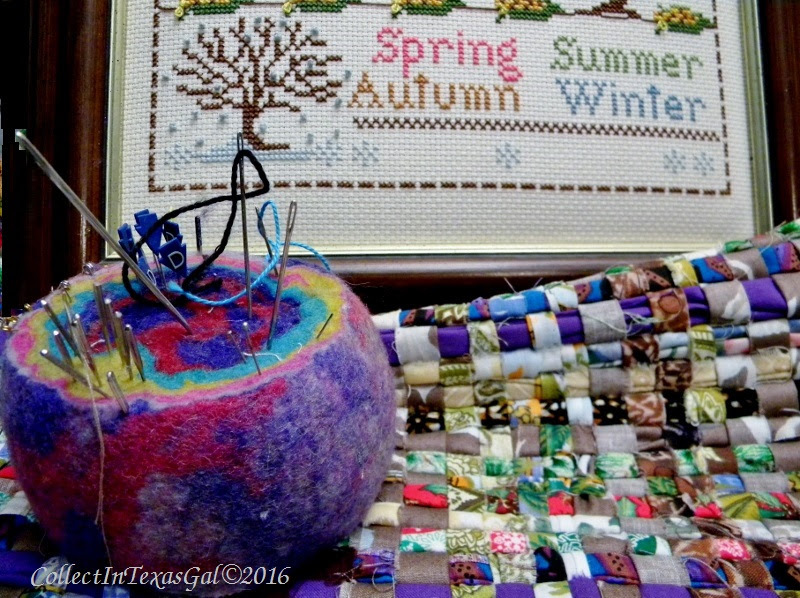 As a matter of fact it was exactly on January 28th...which was Wordless Wed...Cross Stitch Collage. Several days earlier on the 26th I posted about finding the sampler and how I am a collector of cross stitch. It went like this..."Cross stitch makes me cross-eyed. Cross stitch counting makes me crazy. 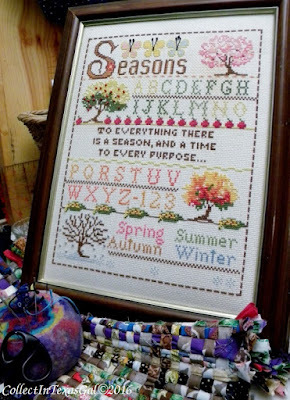 I collect cross stitch samplers done by someone else...anyone else...definitely not by me." That post...Cross Stitch Sampler...Meant for Me. It happened again! Same place, same price, same month...different year, and the same reaction of how could anyone not keep this as a family heirloom. Just like last year, it's the same conclusion...it was 'Meant for Me'. Some things don't change from one year to the next. Cross stitch still makes me cross-eyed and counting cross stitch will always make me crazy. Yes, with clear eyes and a clear conscience. Had I left it there...it would have haunted me. I'm guessing it was a sample or a gift to someone who had no appreciation for the work involved I cross stitch. If it was the latter I would suggest reevaluating that friendship, no more gifts to that person. It's a real act of love to gift needlework. Either way I'm pleased the piece now has someone to love it. I agree, Linda, needlework is a special gift and before giving...as much thought should be given to how it will be received. I found a beautiful sampler in a junk store not long ago. It would have taken me a year to complete it! Yes, at least a year for me too. I like the instant gratification of counting out dollars at the check out rather than counting cross stitches. Key word for me is FINISH. I might start one thinking it would be therapeutic...then I get cross eyed and crazy and end up in the closet. Funny how these cross stitch pieces 'come home' to you. I love to do cross stitch, and know the effort that goes into every piece, so it's good that these orphaned pieces go to a good and appreciative home! You give me hope of someday doing a cross stitched piece. Afterall, from what I see and know of you...you are not cross eyed or crazy as a result of being a cross stitcher. It will be a SMALL piece, and until then I'll continue to be an appreciative collector.